The aim of the day is to show that the Welsh language belongs to us all and that we can all use the language we have throughout the year- in the shop, at the leisure centre, at work, when seeking a Welsh language service, with friends – everywhere. This is an opportunity to raise public awareness about the Welsh language – and where better to start than with the way we greet each other! Diwrnod ShwmaeSu’mae! is a golden opportunity to reinforce the wide support that there is for the Welsh language in today’s Wales and to celebrate the numerous ways we greet each other in Welsh within our communities. It will also be an opportunity to support and encourage the efforts of all those learning to speak Welsh across the whole of Wales. Under the UniPlanet banner 'Bringing Sustainability to Life' the University will promote the day across campus to get everyone to greet each other in Welsh and 'bring Welsh to life’. A 10% discount on a paned of tea or coffee will be offered at all university catering outlets for those using their Welsh. 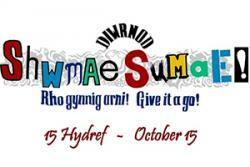 With the help of the sound clips on the Cymorth Cymraeg page, why not try out your Welsh with a quick Shwmae or Su’mae?